Fassinating Fassbender - A Michael Fassbender Fan Blog: Mr. & Mrs. Fassbender Day! Mr. & Mrs. Fassbender Day! 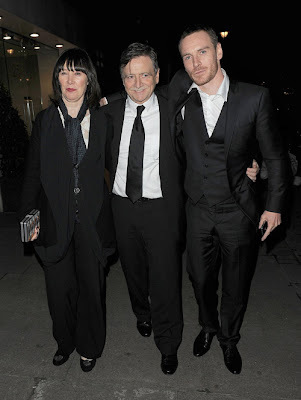 Adele, Josef, and Michael Fassbender. In light of learning about Daddy Fassbender's full-time job of Google Alert watching over his boy's media and gossip highlights, it gave Fassinating Fassbender the idea that when it's all said a done, and no matter how much we proclaim to adore Michael Fassbender, there are two people who love him more and much longer than we have. To close out a rather interesting week, let's take a moment to say thank you to Josef and Adele Fassbender for giving us Michael. By the power invested in me, I hereby honor them for being the Original Fassinators and keepin' it real since 1977! Lol that's a really good idea Simone and I completely agree with you ! Thank you to Adele and Joseph Fassbender for giving us an extrexemely talented actor as Fassy :D !!!! Oh yes, thanks to them! This picture is great. The original Fassinators!I love this way of calling them. Reading how Mr. Fassbender has a google alert was a riot. It is just too cute. The line, "There's some stuff on the internet…" had me laughing. Imagine your mom or dad calling starting that sentence. Great idea having a day to salute his mom and dad! What a great idea to celebrate our favorite actor’s parents. I definitely need to check out the GQ article with the quote from Mr. Fassbender. It sounds like it’s hilarious! I love the way Michael is frank in his interviews and sticks to what he believes in. He is a real manly man, someone who isn't easily swayed. A true maverick that has a wonderful relationship with his family, and that is why we all love him.